Charles 'Chuck' Aaron is the only pilot licensed by the FAA to perform aerobatics in a helicopter in the United States, and one of only three such pilots in the world. In 1980, Aaron worked on the air rescue program for NASA's Space Shuttle, and he founded his own company, FX Helicopters in Westlake Village, California in 1997. Chuck made his last pefomance at the 2015 Red Bull Air Race World Championship in Las Vegas. Aaron is also an experienced test pilot, having test-flown a tracking system for the Boeing AH-64 Apache; and an infrared vision system as the first helicopter pilot to deliberately fly into brownout conditions. He is also an FAA certificated Airframe and Powerplant(A&P) Mechanic, known for having assembled three working TAH-1F Cobras from surplus parts. 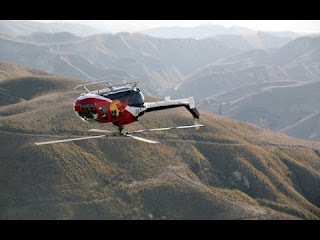 Aaron performs aerobatic maneuvers—loop, roll, vertical climb, Split S, Cuban Eight, Immelman, and “Chuckcevak” (modifiedLomcovak)—at air shows and other demonstrations in an MBB Bo 105, with proprietary modifications invented by Aaron, that allow it to perform maneuvers previously impossible for helicopters. 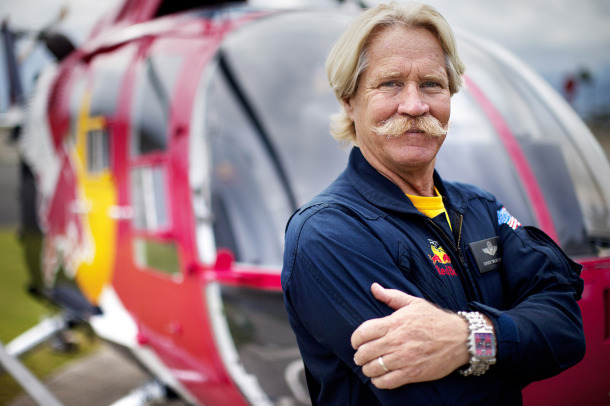 He serves as Chief Pilot and Director of A&P Maintenance for the “Red Bull Air Force”.